Viernes de vocabulario: ¡échate a la vida! Following up on our discussion of echar, we’ll look at reflexive uses of this verb. echarse, to throw oneself, does have a literal meaning. El gato se me echó encima, the cat pounced on me. However, the most common use of echarse is with a and an infinitive. It means to begin doing something, usually in a sudden manner. Se echó a llorar, she burst into tears. Se echó a reír, he burst out laughing. When I saw the big scary dog, me eché a correr (I burst into a run). In English, you can “go to sleep on the job” in a literal or a figurative sense. So, too, in Spanish. La maestra se echó a dormir, por eso no regaña a estos chamacos. The teacher’s gone to sleep, that’s why she doesn’t scold those kids. Someone who’s given up completely se ha echado a morir, with the same figurative meaning as in English. The complete opposite would be echarse a la vida, or to really throw yourself into life. echarse a perder means almost exactly the same thing as descomponerse. If your car se echa a perder, it’s broken down. If the fruit in your refrigerator se echa a perder, it’s rotten. If your kids se echan a perder, you’ve spoiled ‘em rotten. When you make a promise or a threat and don’t keep it, what do we call it in English? Backing down, backing out, or going back (on your word). Me amenazó con la escoba, pero cuando le dije que me pegara, se echó atrás. He threatened me with the broom, but when I told him to go ahead and hit me, he backed down. If you’re pretending to be brave when you’re quaking in your boots, te las echas de valiente. If you’re trying to convince all your friends that you’re a ladies’ man, te las echas de galán. echarse las manos a la cabeza means, quite literally, to put your hands on your head, but the English equivalent is to bury your face in your hands. It means, essentially, to be so scandalized that you have to cover your eyes. Day of the Dead (Dia de los Muertos) is an annual celebration that manifests a rich blend of Catholic and indigenous traditions. Spirits of the beloved dead return to their homes and visit for a short time with their families and friends. The first day of November the souls of departed children arrive, and on the second day of November they are joined by spirits of adults. Like all visitors, they are welcomed with food, drink, stories, memories, and good will. Their presence is thought of as a blessing rather than a curse, and brings joy to their loved ones. 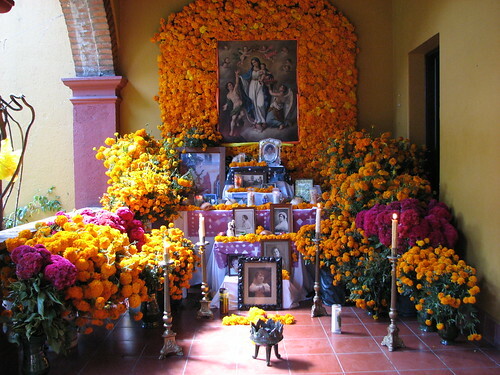 In preparation for this celebration, the last days of October are spent preparing special loaves of sweet bread (pan de muerto), and desserts; making mole, harvesting special flowers, including marigolds (cempasúchil); creating altars in the home and decorating grave sites. Decorations in the form of macabre but whimsical skeletons and candy skulls abound. Death is not to be feared but embraced. As an English speaker, you’re used to talking about temporary states using the verb to be. You can be hungry, be thirsty, be sleepy, be hot, be cold be in a hurry, be right, be afraid, be jealous, and all kinds of other short-term feelings. In Spanish, however, you can’t be any of these things – you have them instead. The most common way to say that you are hungry or thirsty is to say, literally, that you have hunger or thirst. No tengo hambre, es que tengo sed. I’m not hungry, the thing is I’m thirsty. If you’re really, really, really hungry, you can say tengo un hambre enorme, tengo un hambre terrible, tengo un hambre tremenda, or even just plain old tengo un hambre to indicate the sheer hugeness of your hunger. This one is trickier because of the potential for misunderstanding. When you feel hot, tienes calor. When you feel cold, tienes frío. Once again, tener un frío and tener un calor suggest that you are really exceptionally warm or cold. Jealousy, much like these other short-term states, is something you have. But watch out: in English, we conflate jealous and envious. In Spanish, if tienes celos, it means you are feeling possessive of someone’s time and energy; if you simply want to have the stuff that someone else has, you are feeling a different emotion, envidia. A whole bunch more, similar to those above. If you’re following me, congratulations – ya tienes éxito. If you’re finding this confusing, tienes toda la razón (you’re absolutely right), because tengo la culpa (it’s my fault). In fact, tengo mucha pena (I’m very embarrassed) that I hae presented so much information all at once. While this one may seem different from the others, in reality the principle is the same. Your age isn’t a permanent trait. Today, tengo 28 años (I’m 28), but just last week, tenía sólo 27 (I was only 27). Anyway, we English speakers think of age as a mood all the time. Haven’t you ever heard that you’re only as old as you feel? Here at the Instituto Cultural Oaxaca, we are beginning to use iPads in many of our classes. It’s very important to be culturally immersed, but it’s also important in this historical moment to keep in mind how central technology is to our lives. Especially for students who plan to use Spanish in a work environment, a familiarity with technology is vital. 1. Songs and movies mean you can hear Spanish at home, not just in the classroom. 3. Play Scrabble and other word games with your friends and classmates! 4. Work on interactive exercises in your free time, getting feedback even when you’re not in the classroom. 5. If you’re at a high level, take advantage of access to news articles, magazines, and books with an e-reader app! 6. If you’re just beginning, use dozens of visual language-learning apps to connect pictures to words. 7. Dictionary apps make it easy to consult multiple dictionaries: get a word’s meaning in English, read a description in Spanish, or look at lists of synonyms, antonyms, or even rhyming words. 8. Interactive self-tests let you focus on your problem areas. 9. With an e-reader, get instant access to hundreds of books and magazines in Spanish. Audiobooks and podcasts are also available for iPad. 10. Skype with your faraway friends in Spanish, or find an intercambio through Skype and practice for free. 11. Familiarize yourself with the layout of a Spanish keyboard.